The first installment in a series of pages looking at the Central Oregon and Pacific's operation in the year 2001. This section follows the South Hauler Job 507 from Medford to Hornbrook where it meets Job 500 from Weed. The cars from 507 continue on south as Job 509 with the crew from Weed. The cars from 500 go north as Job 502 with the crew from 507. While this may sound confusing, it gets the trains over the railroad efficiently while returning each crew to their homes and families each night. Sometime last summer I'd promised Andrew that we'd follow the Central Oregon & Pacific's South Hauler from Medford over the Hill. 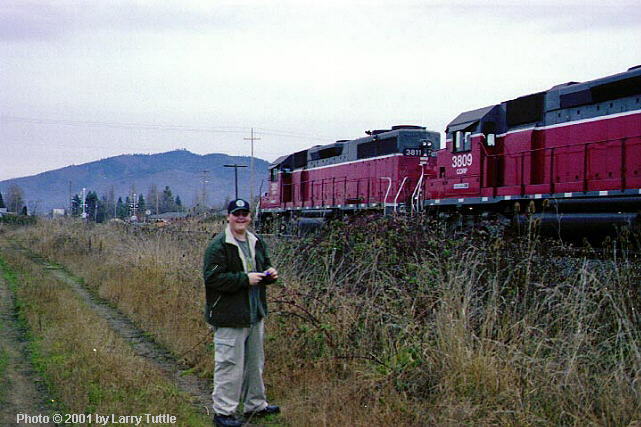 Fulfilling that promise kept getting put off until one weekend in January when we were both free and Andrew could get his first railfan adventure watching a freight negotiate the sharp curves and steepest mainline grades in the West. January 20, 2001 dawned cold and gray, but at least no precipitation was forecast. We were off! After inspecting the Hauler from a distance in the Medford Yard, we stopped by local hobby shop and picked up a couple model train mags. This proved to be something of a mistake as we missed the Hauler's departure through downtown Medford. "No problem," I said as we easily caught up with the train along South Pacific Hwy. and followed at a leisurely gait past the fruit packing houses and into the orchards. 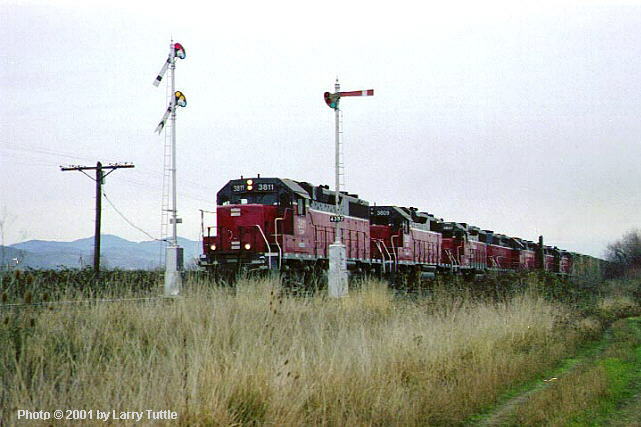 Near Talent, we get far enough ahead to park and walk a hundred yards to a set of Semaphores 4346/4347 for this classic 3/4 shot of the Hauler splitting the blades. 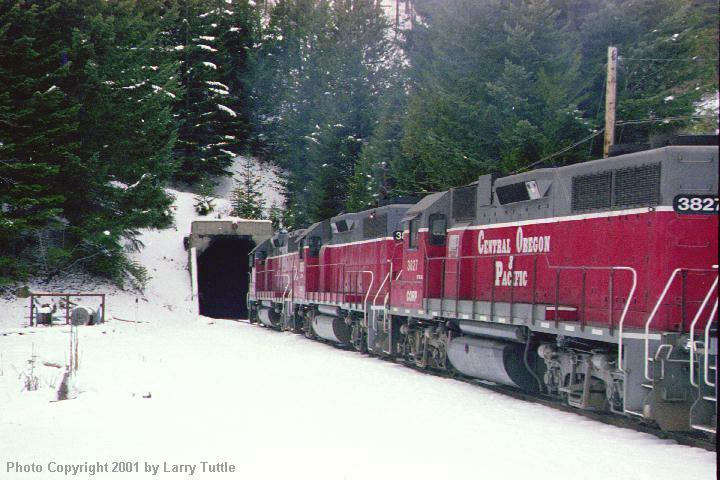 Today's train has 7 GP-38's and GP-38-3's with 30 loads, 9 empty log cars. I figure it's about 3450 tons: a good sized train; the max without helpers . The power roars past, the crew waves and as I turn to fire off a going away shot, I catch Andrew with an ear-to-ear grin. Wipe that foam off your face, Andrew! Getting well ahead of the train, we stake out this location at the north end of Ashland at Semaphores 4302/4303. After a short wait, along comes the subject of the day's adventure. I have to wonder what the morning patrons in the Breadboard Restaurant thought looking at two guys standing in a blackberry patch on a cold winter morning. Than again, who cares? Heading south along the Old Siskiyou Highway, we arrive at Steinman well ahead of the train. We do a little exploring, find the old water tank footings and the concrete pad the water spout used to stand on. Steinman used to have a siding and offered the first water south (SP west) of Ashland. Shortly the Hauler comes grinding along and as I prepare to take this picture, I notice some movement inside the cab of the locomotive. Engineer Matt Shaw (a friend and something of a comedian) comes out on the walkway and stands at attention saluting. Thanks, Matt, that's the first time I've ever been saluted by a trainman. Less than a mile by highway from Steinman and only two miles by rail, the Hauler takes 10 minutes to reach this location at MP 417. In those two miles, the train has traversed Gregory Loop and is now pointed more or less north as it snakes its way up the Siskiyous. With the Old Siskiyou Highway in the background one can start to appreciate the 3+% grade of the Siskiyou Line. As the train passes we get a look at a set of reverse curves. In another 10 minutes this train will have crossed I-5 still facing north, reversed its compass direction inside Tunnel 14 and reappear through the trees halfway up the mountain in the background. At that point it will again be pointed south, moving from right to left across this picture. But, we don't wait for that today; we're off to Siskiyou in the snow. Finally at Siskiyou (elev. 4130') the grade levels off. In the 17 rail miles from Ashland this train has climbed over 2250 feet. 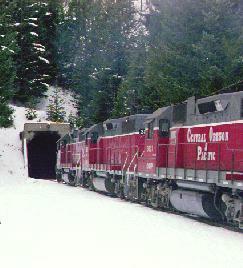 As the power enters the north portal of Tunnel 13, it's at the very crest of the grade. Inside the tunnel, Matt will close the throttle, shift into dynamic braking, set some air and then come back out on the throttle to control the train's descent into Hilt.